Low back pain is a common condition that most people experience at some point in their lives. 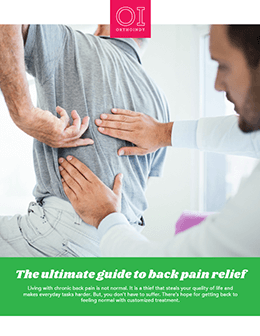 There are many reasons why someone may have lower back pain, but the treatment depends on the underlying cause. Common causes of low back pain are often troubling but do not require urgent medical care. These symptoms of pain may vary from mild to extreme. Some symptoms may indicate a more serious problem which requires urgent attention from a physician. Pain that radiates into the leg with a sudden loss of function in the leg or loss of the ability to control bowel or bladder function. To treat your pain your physician will ask you for your complete medical history and have you describe your symptoms. A physical examination will also be performed. The physician may look at your back and push different areas to see if it hurts. An imaging test such as an X-ray, CT scan, MRI , bone scan or bone density test may be necessary to confirm a diagnosis. If a patient does not feel relief after a period of time they may benefit from injections or possibly surgery. Determining the best course of action is based on establishing the correct diagnosis for the cause of pain and then creating the plan most appropriate for the patient and their diagnosis. Exercise, proper lifting, healthy weight maintenance, avoiding smoking and proper posture may help to provide lower back pain relief.